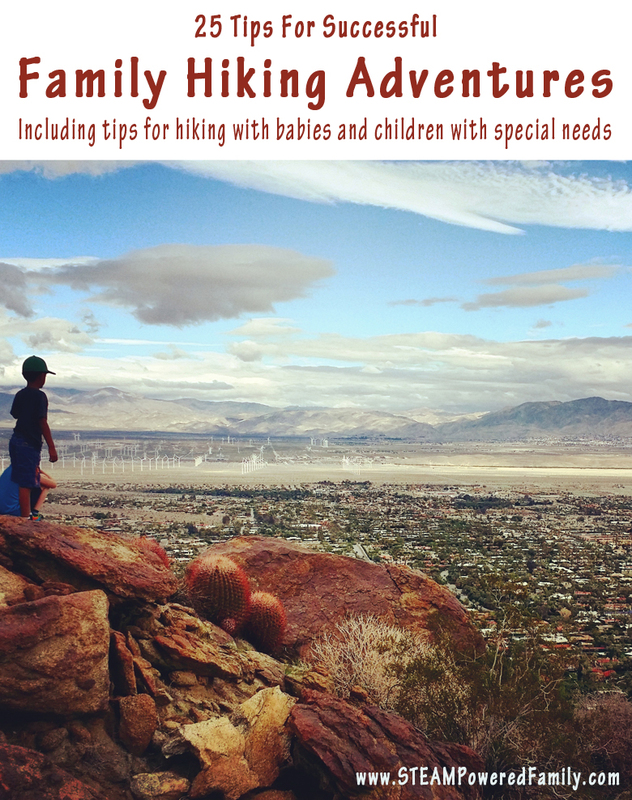 25 Tips For Family Hiking Adventures - Including tips for special needs, sensory and trauma. 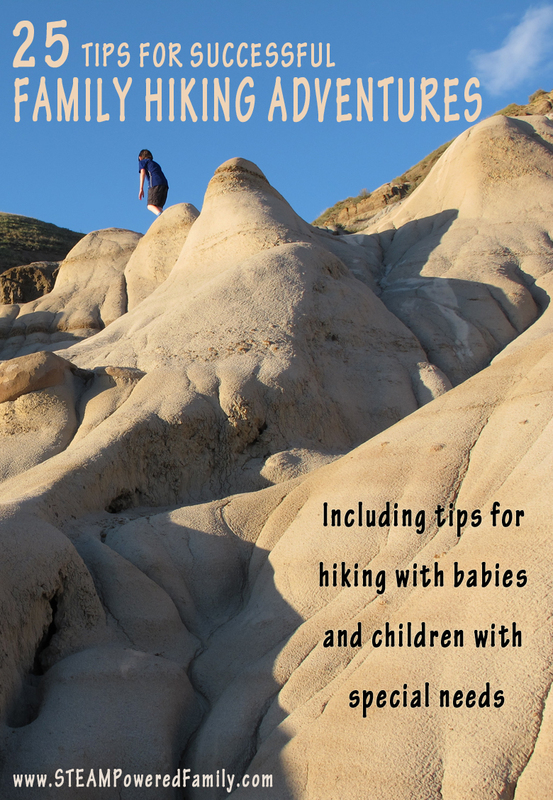 25 Tips For Family Hiking Adventures – Including tips for special needs, sensory and trauma. One of our favourite things to do as a family, especially on vacation is to go hiking. We’ve been doing this since our oldest was just a baby, and even when dealing with anxiety, PTSD, sensory issues, and trauma histories, hiking has become a family favourite. Here are our tips for a fun day of family hiking adventures for all ages and abilities. 1 – Research and pick your hiking spots carefully. Know the limits of all your hikers and plan accordingly. It is always better to start easy, short and small and build up as everyone gains strength and confidence. 2 – When picking your hiking trails and locations look for features and spots that will get everyone excited. Maybe a waterfall, or incorporate some geocaching, or an amazing lookout point. 3 – When hiking with a baby in a carrier make sure the carrier is one you are comfortable wearing for a long period of time and the baby is very comfortable. You don’t want to get half way through a hike and discover it is chafing or hurting your back. 4 – If you are breastfeeding plan your outfit accordingly so you can easily breastfed even if there isn’t a comfortable or convenient spot to sit. I once breastfed my youngest at the top of a mountain in Banff, perched on a fallen tree, while it was snowing. It was bizarre, surreal and so memorable. 5 – Plan proper outfits for everyone. Make sure everyone has proper footwear (well broken in and won’t cause blisters and are appropriate for the terrain), socks, pants may be better to protect legs, layers are great. Spend some time researching weather and the area to ensure everyone is properly protected. You may also want to pack a change of clothes, especially socks, depending on the hike. 6 – Bring bug spray, sunscreen, hats, water, all the basic essentials for a day outdoors. 7 – Bring a first aid kit. This can be as simple as some water and bandaids for smaller hikes, to full kits for longer adventures that will bring you farther from help. 8 – Charge your cell phone before you leave. You may or may not be in cell phone range but if something happens at least your battery will be full so you can move around looking for a signal and help. 9 – Make sure someone not going on your hike is aware of your plans. Consider sending this person a picture of your group before you leave so if searchers are required they know what you are wearing. Simply snap a selfie of your group and text it to your contact with your expected return time. 10 – Pack lots of water and consider packing a LifeStraw in case of an emergency. We love our Lifestraw and if something was to happen at least we can have safe drinking water. And it weighs almost nothing and takes up almost no space. 11 – Print off a map of the area at home or grab one if they are available. Make sure you always stay on the trails. 12 – Like any adventure with kids, pack in such a way that all the kids stuff can be easily carried by the adults. Since you will probably end up carrying them all anyway. 13 – Know the dangers. Find out what plants to avoid in the area, find out what wildlife you might encounter and how to prepare and react. Bring appropriate equipment to deal with nature. Bear spray, whistles, anti-itch creams, identification charts for wildlife and plants, etc. 14 – Keep it fun. Hiking is great exercise and a great adventure, but everyone will struggle when tired. Don’t push it too far and remember to turn back before everyone starts getting tired and exhausted. 15 – Take lots of time to smell the roses. Well maybe there won’t be roses on your hike, but make sure you take lots of breaks. Hiking with a family isn’t about how far you go but about the quality of your time together. Maybe it takes you two hours to hike a half a mile, but if they spent most of that time watching bugs and enthralled with their discoveries, then I think that is a great success as a family hike. 16 – Pack those gadgets! For the older kids packing things like compasses, binoculars, LifeStraws, cameras and more just add to the fun and adventure of the day. 17 – For kids not into gadgets make it treasure hunt or collect cool things you find along the way. Like unique rocks, leaves, etc. 18 – Plan your day around the needs of everyone. If you have a child that naps at a certain time then plan to be finished before nap time. Or if you have night owls, don’t plan a sunrise hike. 19 – Pack snacks like trail mix, jerky, crackers, and lots of water. Even for hikes that are only going to be a couple of hours you never know what might happen. My parents once got lost for 2.5 hours on a hike that was supposed to be a short little outing. Thankfully they had food and water and eventually found their way. I also have found that kids need that extra jolt of calories. Especially when they are in growth spurts! Nature and hiking make them even more hungry. 20 – Enjoy your family adventures! These are the memories that will stay with everyone and the best memories are those that happen naturally and spontaneously. Nature is amazing, experience it together! 21 – If you have a child with sensory needs hiking can be great, but make sure all the clothing is non-irritating and, if it is something that helps your child, consider giving them a backpack with a bit of weight in it to help them stay regulated. Just watch them closely, as the hike itself may be enough input to keep them regulated. 22 – Be aware of trauma triggers. For our youngest buzzing insects are a major trigger. Be aware and prepared. If there is the possibility of a panic attack or triggering episode, make sure you chose a safe environment. If someone does get scared or have a triggering episode focus on safety and give them the support and time they need to overcome it. This could be a wonderful healing experience for someone. 23 – Dehydration and hunger can cause all kids to struggle and many kids don’t recognize the signs their bodies are sending, especially if they are anxious or worried or distracted by a new adventure. So if you start to see anyone struggling, stop for a drink and snack. A break and refueling may be all that is needed. 24 – While out hiking, the fresh air, exercise, quiet and distraction free time can lead to some amazing connections. Take it slow, but if you think there is something your child is struggling with a hike may be a great way of connecting and getting them talking about their inner thoughts. 25 – With the right research, equipment and chosen paths hiking is something everyone can do. It is great exercise and a wonderful way for families to connect. Bonus, bonus tip – Make sure your group stays together. No wandering or going off on your own. No hide and seek! Teach your children that they must stay in sight of you at all times, on marked trails, and stay safe. I also sometimes dress my kids in really bright shirts for hiking so they are easy to see at all times and recently our Scout troops taught us that we should all wear whistles while hiking in case we get lost. We will definitely be doing this on all future hikes. Do you have any other tips for families hiking? I’d love to hear them. Please leave a comment below. Have fun and happy hiking!